Principal chamber of Ramses V tomb with sarcophagus. 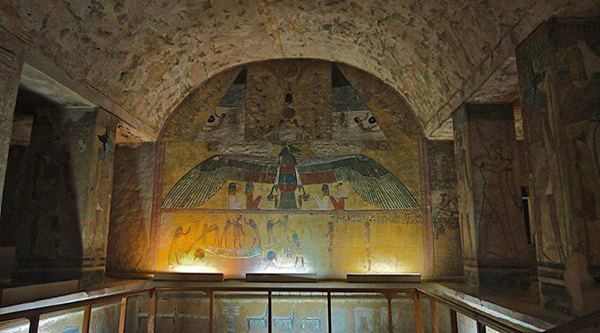 Inside the tomb of Ramses V.
The tomb is located in Wadi Biban el-Muluk , KV9 and is known since antiquity. Romans knew the tomb as the tomb of Memnon and the savants of the Napoleonic Expedition as "La Tomb de la Metempsychose". The Royal mummies of Ramesses V and VI removed in antiquity. The tomb was excavated between 1820 and 30 by James Burton, but unpublished. Later in 1888 Georges Daressy excavated it for the Service des Antiquites. The tomb was started by Ramses V and was usurped by his successor. The only funerary objects of Ramses V known are a wooden box fragment from the tomb and possible wooden coffin peg from Davis's work in the valley. Everything else found in the tomb was prepared for Ramses VI. Ramesses V seems not only to have begun the tomb but to have been interred here in a double burial with Ramesses VI. The tomb has 3 entrance corridors, 2 chambers, a further 2 corridors, one after the other in a straight line, leading to the ante-chamber and the tomb chamber. The wall representations are carried out in painted low relief. The standard of craftsmanship is not high, but the tomb chamber has one of the most important ceilings in the Valley of the Kings. The corridors are larger in width and height than in some other tombs, but are without the stair-and-ramp configuration found in KV2 for example. The passage H is unique in having a horizontal roof combined with a sloping floor, because here the stonemasons, cutting from top to bottom, had to drop the level to avoid another tomb (KV12). The burial chamber itself is not completely finished. The coloured sunk reliefs are well preserved and heavy emphasis is placed on astronomical texts and representations. Clearance of the single "sarcophagus pit" in the burial chamber floor by Edwin Brock in 1985 revealed that the adges had been cut back, perhaps to accommodate the base of a granite outer sarcophagus box, no trace of which was found. The unfinished inner, anthropoid sarcophagus of green conglomerate had been smashed to pieces in antiquity, the best known of fragments being the large face mask of Ramesses VI now in the British museum. No sarcophagi are known for Ramesses V. Other finds brought to light by Brock included pottery, fragments of wood and calcite shabtis, and a coin of the Roman emperor Maximian. The mummies of both Ramesses V and Ramesses VI were discovered in the KV35 cache in 1898. The mummy of Ramesses V lay in the base of a white-painted wooden coffin and that of Ramesses VI in a replacement coffin originally belonging to a high priest of Menkheperre named Ra.